Anyway, I started out yesterday morning with my weekday hard-boiled egg. Then for lunch, I mixed the mixed bean stew (this is lasting forever!) with rice, cheese, and tuna. I also discovered that when you get into tuna when you have three cats, you will find all three cats love you. Very much. They’ll even get along with each other (despite being mortal enemies) just for the smell of tuna. Then for dinner (right before I headed to rehearsal), I decided to use up the rest of the non-mixed beans. 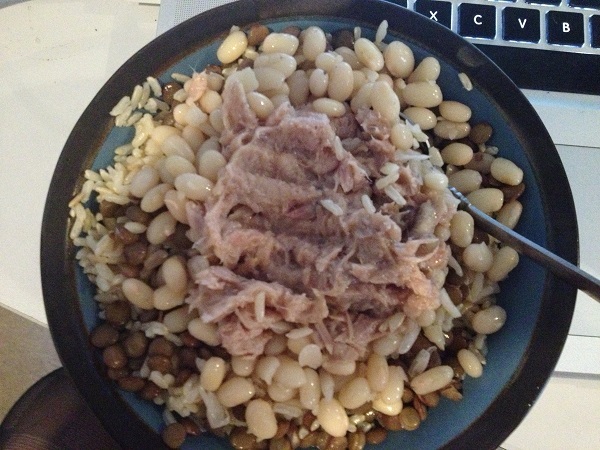 So I put rice in the bowl, heated that up with some butter, then put lentils and navy beans on top of that. I topped the whole thing with tuna. 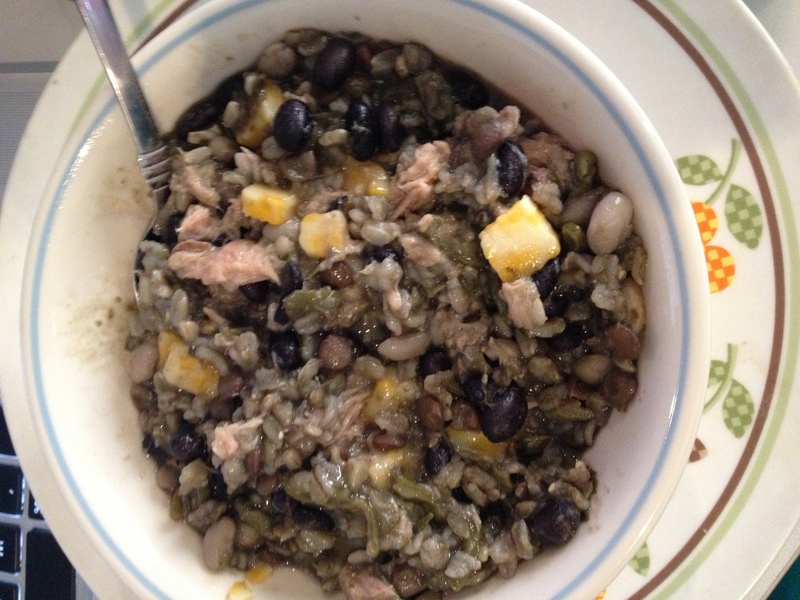 I got two bowls of this and did use up the rest of the lentils, navy beans, and tuna with this dish. Again, cats loved me. Then I fled to rehearsal and .. yah. But while I was still run down last night, I seemed to be starting to get used to it, so wasn’t quite so faint or miserable about it. Well, I did blow up at Derrick once yesterday. Sigh. So this morning I gathered up the rest of my eggs, my rice, my bean mix, and my tomato sauce, figuring the rest of my meals are going to be at work, and brought it all in. I ate the penultimate hard-boiled egg this morning, and then went and got the pre-determined bagel and cream cheese and a donut. I didn’t get a picture, because they were gone before I got back downstairs. Yum. Then, due to having upper management in the office, we were given a free lunch. WITH FRESH VEGETABLES. Holy cow, carrots, cucumbers, zucchini, and .. olives… never tasted so good. I loaded up two plates of the fresh veggies, because .. YUM. I also got half of a Jimmy John’s gourmet veggie sandwich. And a can of DIET DR PEPPER (my usual addiction). So, I will go to my audition satiated, refreshed, and filled up with energy and fiber. I feel like.. 3000% better, seriously. My mood is elevated, my eyes feel better (I actually was starting to get an infection in my tear duct from rubbing them too hard Saturday night, and now it seems to be gone.. and it wasn’t this morning), and I just generally feel happier and ready to take on the world again. Tomorrow’s my last day, and I’ll be eating the rest of the stuff I brought into work. I also get a break tonight from prepping food, since it’s already prepped. And in two days, I’ll be at #AsIsTradition post-rehearsal DRINKING BEER AGAIN. Yay!